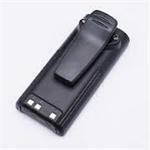 BP-209N : 7.2 volt 1100mAh rechargeable Ni-Cd battery pack for ICOM radios. Fits IC-A24, IC-A6; IC-V8, IC-V82, IC-U82, IC-F3, IC-F4GS, IC-F30, IC-F40, IC-F31, IC-F41, etc. Replaces original battery #s BP-209, BP-209N, BP-210, BP-210N, BP-222, BP-222N. Includes heavy-duty spring-loaded belt clip. Re-charges thru the radio (if so equipped) with the BC-110AR wall charger, or in Desktop Chargers (EMS-210, EMS-210-211,BC-144N) etc. BP-210 (MH): 7.2v 1650mAh rechargeable Ni-MH battery for ICOM IC-V8, IC-V82, IC-U82 radio etc. Replaces BP-209 , BP-210 , BP-222 , etc. Provides longer running time, while physically remaining the same size. BP-210NEX : 7.2 volt 2100mAh READY-TO-USE rechargeable NiMH battery for ICOM radios. Fits IC-A24, A6, V8, V82, U82, etc. Arrives PRE-CHARGED ! These eneloop-technology batteries RETAIN THEIR CHARGE when not in use.